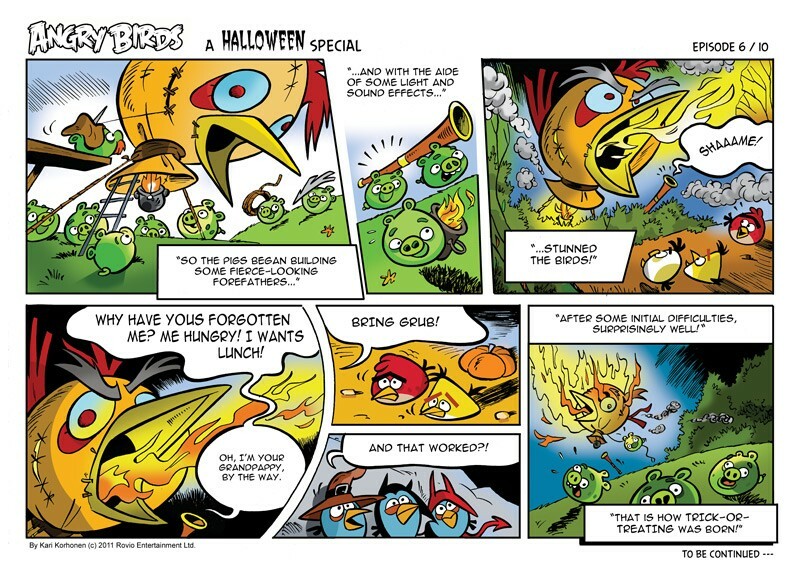 In honor of Halloween Rovio is doing another daily comic strip. The first was for the Chinese Moon Festival, which you can check out in this post. 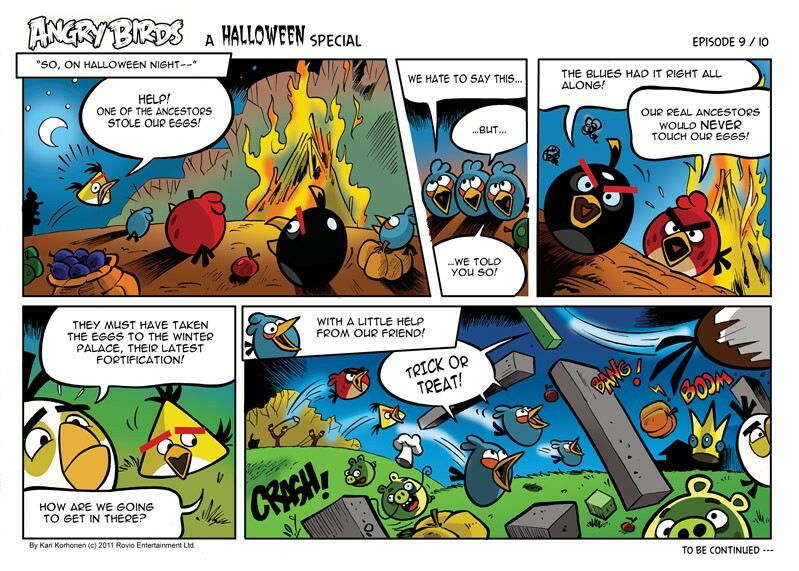 This is the third surprise from Rovio in the past week or so. 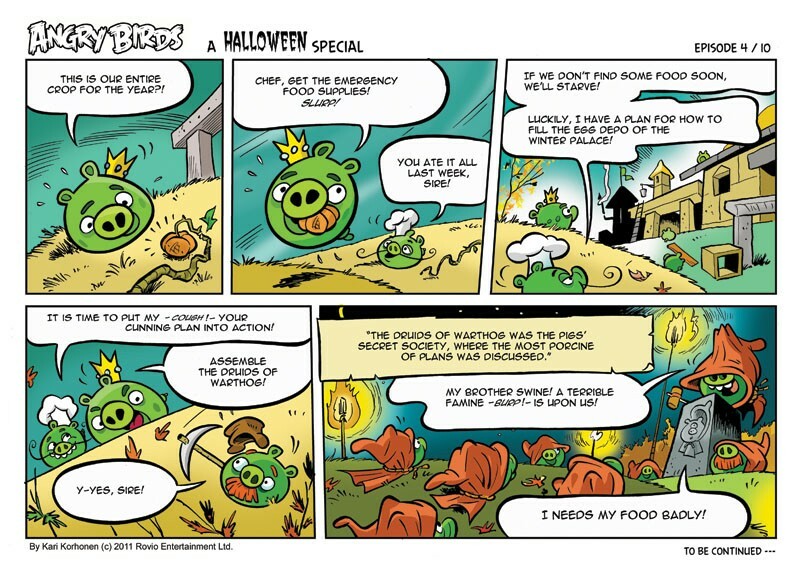 First was the quiet (then formal) announcement of a Ham’o’ween update. 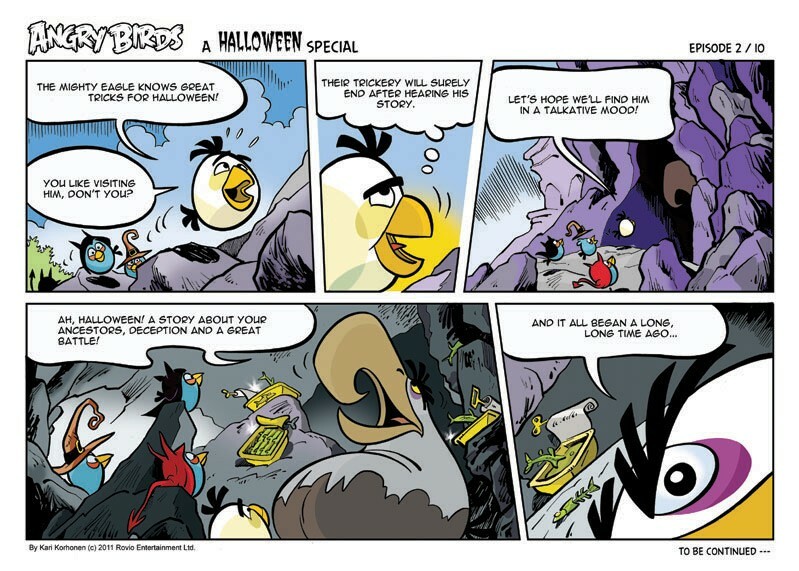 Next the revelation of the all-new Globe Bird. And now a comic! This makes me think that the ABS update isn’t going to come out till next week(. Why? 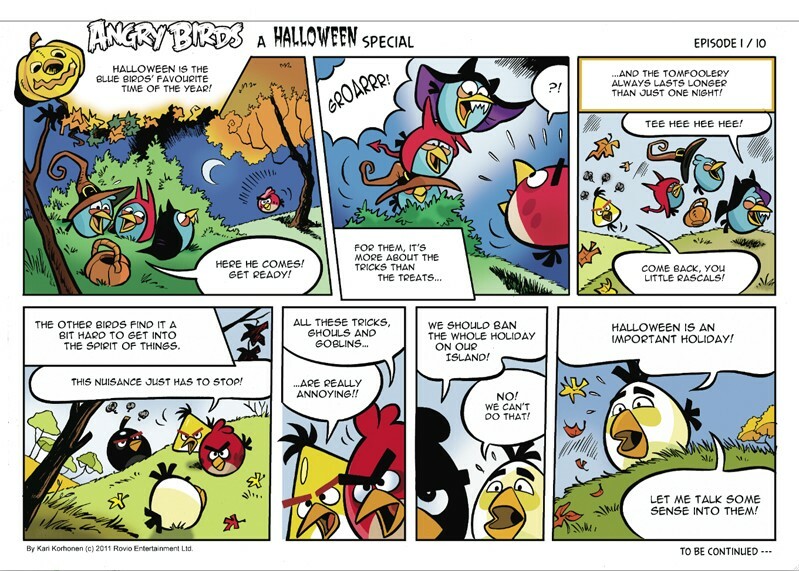 The moon festival was out before the comic was completed. 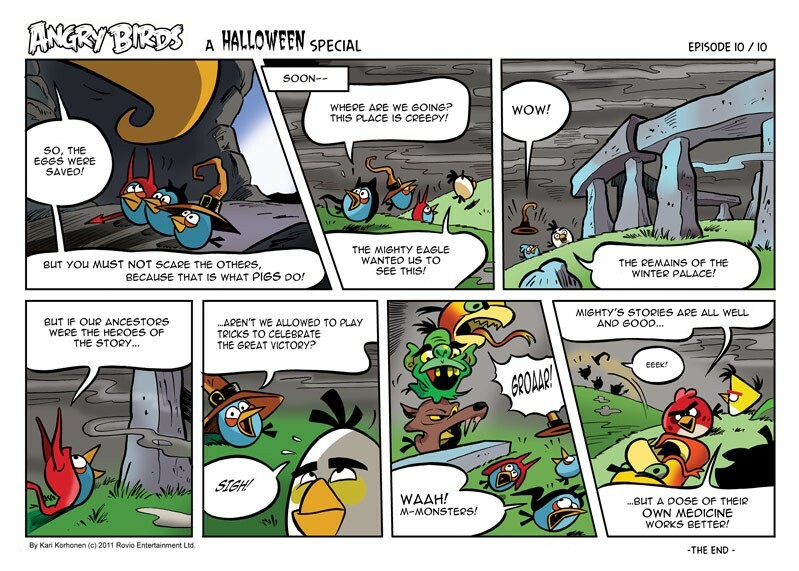 @Minion1021, I just thought that knowing the back story first behind the new bird would give even more anticipation for the update. Anyway A few more hours and well see.. When you open your Game Center, you can see the new app logo of Angry Birds Seasons! I think its gonna be out early tomorrow morning!! It’s out!!! Available on iTunes now!!! its out. play on your iphone yall. the orange birds gets huge. 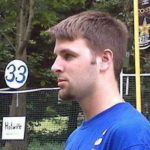 2012 new season games. so exicted!! Yeah, playing on the train in Japan, the globe bird is a trip. Going to take some figuring out how best to use it! Stick the Globe bird in a tight space.He inflates automatically. Easter, Summer, Valintines Day, St,Pactricks Day, And Christmas? Probably he/she means that there are no comics for the other episodes. 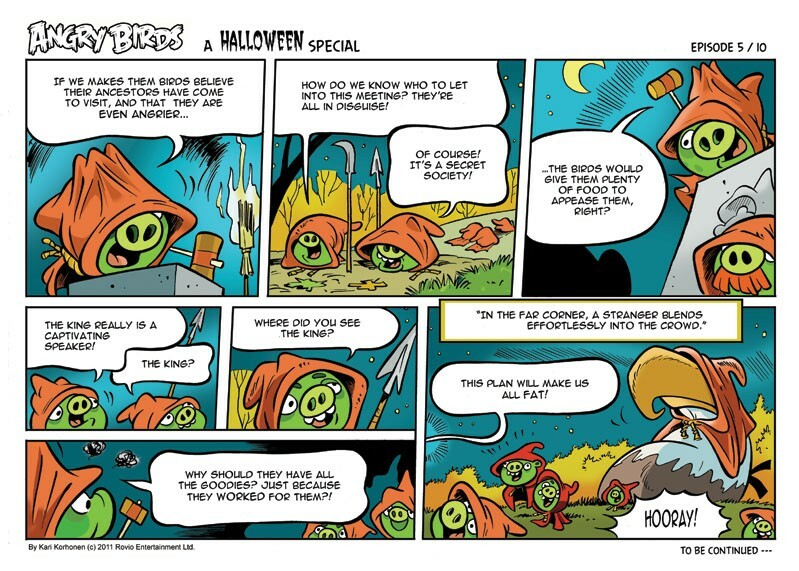 Is it just me, or is episode 2 of the Halloween comic showing up as a broken link? Nope, seem fine to me. Have you tried to refresh or empty your cache? Yep. Didn’t work as it still isn’t visible here nor at angrybirds.com. 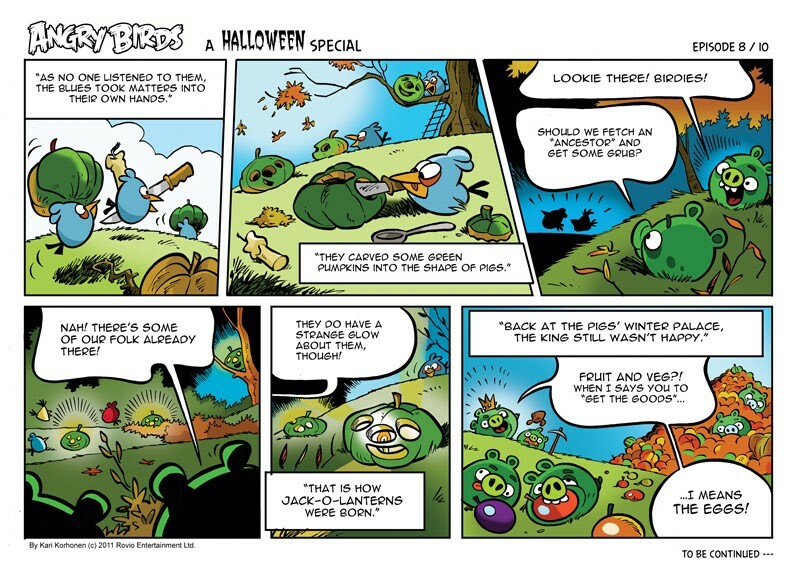 I have just updated the page to include all four available comics. What can you see? I see all four fine. Still missing Episode two. I can’t tell if the HTML is being mangled at my end by my tablet browser, or if I’m being served a corrupted. File packet, or if something else is going on. I’m gonna try installing Firefox for Android, to see if that fixes the issue. With my IE8 i can’t see it either, bit with my Firefox i don’t have a problem. Thanks all, I’ve fixed the issue. It was one of those weird things only affecting certain browsers. Wopper, thanks for mentioning IE8. That’s how I tracked down the issue. Guys, using IE8, still showing up as a broken link. Ep. 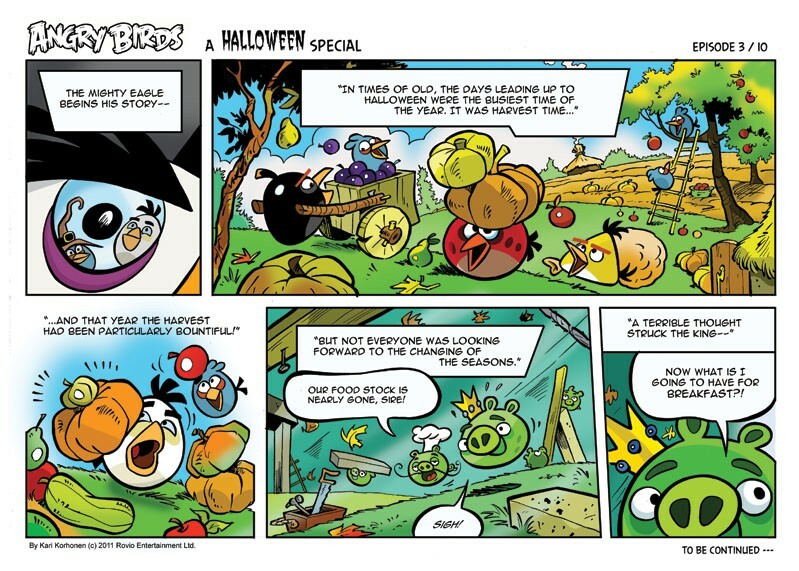 2 is not available here or on angrybirds.com. Tried clearing my cache. It’s a picture of a white box with a X at the top left corner. I still haven’t seen ep 2 and I’ve tried using the Android native browser, both on my Xoom tablet and my DroidX phone. Additionally, I’ve also tried using Firefox Mobile on the Xoom. All to no end, as I still have not been able to see it. Alright, I deleted the code for Episode 2 and replaced it with Episode 3, changing all 3’s to 2’s. I’ve checked in Mozilla, IE, Chrome, and Safari on iPhone and iPad. Errrrrrrr…I think I have fixed it…again. This is one of those weird issues that leaves me scratching my head. Now it’s flashing on IE8. Yes, flashing. It stops after ten flashes though. At least we can see it now! BirdLeader, I can finally see ep 2. And in both browsers on my tablet, so I think that this problem is finally able to be laid to rest. I haven’t built any websites in 15 years, but I do know that some browser engines are less forgiving of code faults than others. Strange it is that IE, the most forgiving of all, should have had problems. How do they carry stuff when they don’t even have arms? 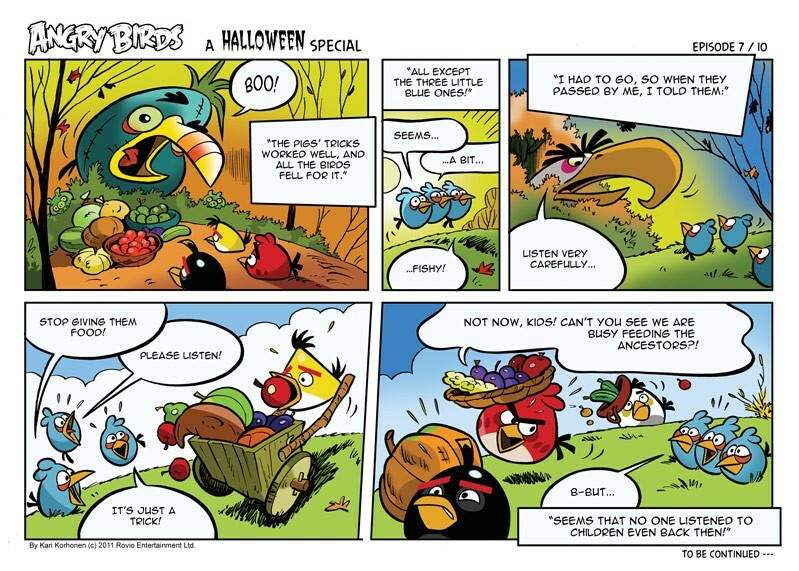 Then why are the blue birds the children? And are they grls or boys? Well, I’d say all of them are boys, judging by the comic. Funny that the King is always hungry and overweight, a theme in the cartoons.